I wrote of this dream first two years ago. Back then, I thought it would be an easy thing, perhaps to work (and confirm) nearly 30 countries on 80m in a single winter. Boy, was I naive. I only added six confirmations on 80m the entire year. Can this shunt-fed tower put me over the top? The next year, I at least had the sense to understand the difficulty of the proposition. I enumerated things I might do that year. In the end, I only did a couple of them. I did not add more radials to the Inverted-L, I did not bring the amplifier up to Floyd county, I never did finish the new K9AY controller. However, I was there a lot. I spent a lot of time on 80m. As a result, I now stand at 89/88 confirmations - I added a dozen over the year. That's twice as productive as the previous year. If I can pull it off again this year with a dozen confirmations, I should be able to meet all the requirements of 5BDXCC. It's going to be interesting. At the moment, the Inverted L, with over 30 lbs of radials, is sitting in a box. I'm still trying to figure out if I can put it somewhere where I can lay down those radials safely. 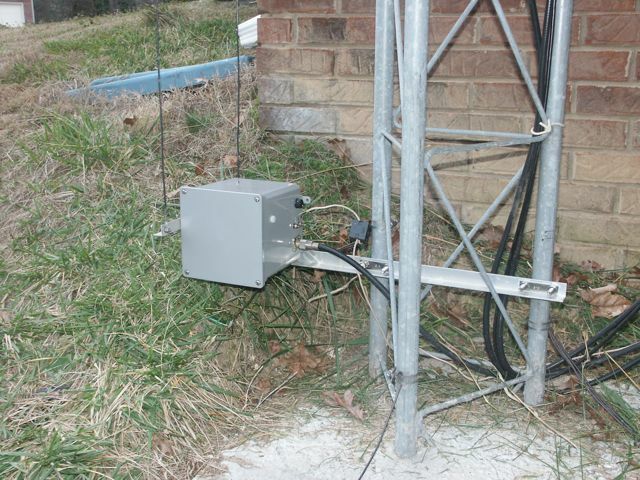 My only 80m DX antenna is the shunt-fed tower in Gwinnett county. 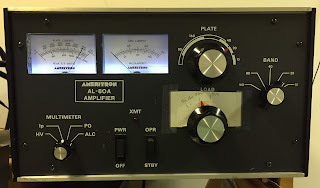 Hard to believe, but it has been 10 years since I purchased the AL-80A. Archie, K4GA owned it before me, and it has served me well since that time. I added a step-start circuit a few years ago, and it's been doing well until April 2014. I wrote earlier this year that the AL-80A had a failure that I traced down to an open 1.5 ohm 3 watt resistor on the meter board. I finally got a replacement part from a source in China. (Well, it was cheap, but not fast) Installing the resistor was the easy part. 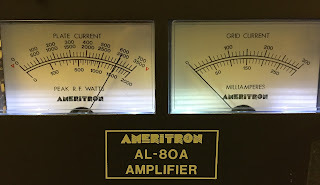 While I had the amplifier away from the operating position, I decided I needed to do a couple of other updates. Back in 2009, I added a glitch resistor, but I installed it on the wrong side of the B- line. 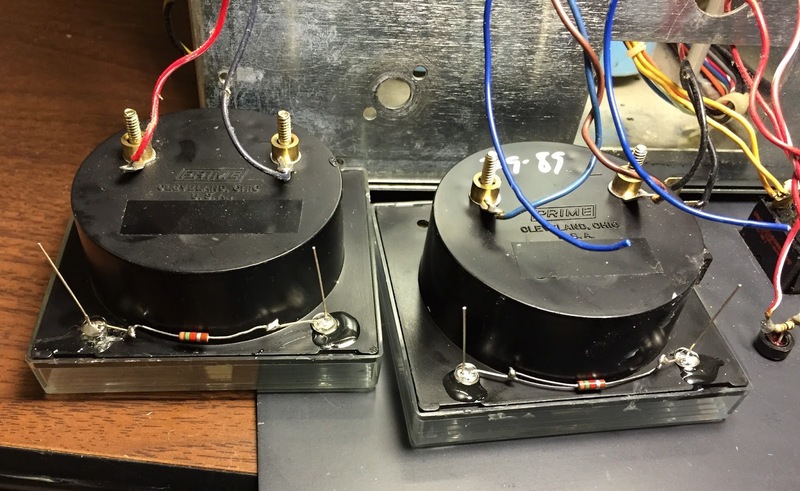 It was between the capacitor bank and the rectifier, where it wasn't doing any good. I moved it into the B- line between the capacitor bank and the meter board. Glitch resistor on the rectifier board. 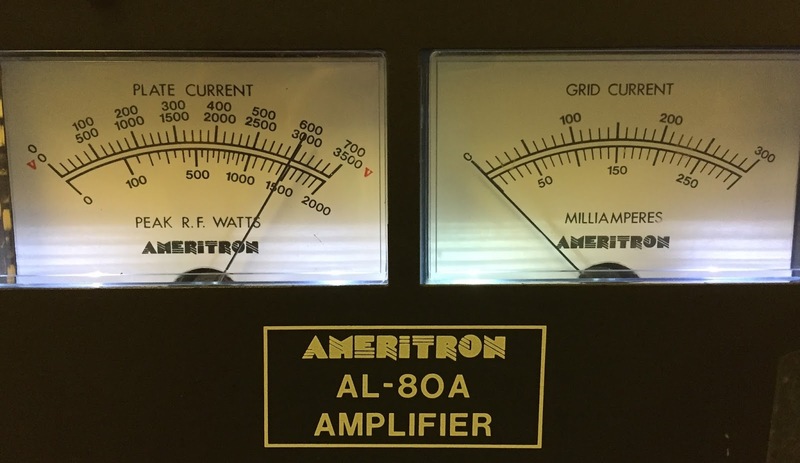 My AL-80A rectifier board had a number of unused lands (likely for full-wave rectifier bridges in other amplifier designs), two of which were perfect for the glitch resistor. 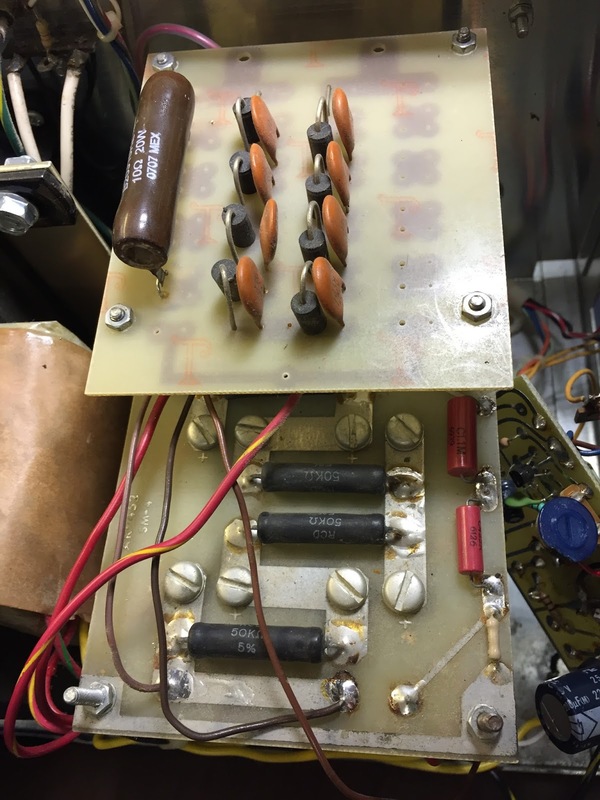 If you look carefully at the photo, you'll see a darker brown wire going from the capacitor bank land near the middle back to up the board. This goes to the far end of the glitch resistor. The near end is hooked up to the brown wire that disappears off the bottom of the capacitor board, heading to the meter board. This made for a neat installation, and now that is is on the right side, it will actually do some good. The other issue I addressed was the meter lighting. Because of a bad trip to Barbados long ago, the two grain of wheat bulbs were not affixed to the grid meter. One of them had been destroyed, and one other bulb on the multi-meter had burned out. Grain of wheat bulbs like this are nearly impossible to find these days, plus I didn't want to have to fool with changing them when they burn out. So, I took a tip from the internet and replaced them with white LEDs. The LEDs were ones I had bought some time ago from Mouser.com. (Mouser part # 593-VAOL-5LWY4 - 4000 mcd standard white / clear LED -- these are still in stock, although you can get way brighter ones (35,000 mcd!) for less money) At 5mm (T 1-3/4) they were the perfect replacements for the old bulbs. The Grid Current meter did not have the holes drilled for the lamps. I held my breath and did this, using a very slow drill speed and working slowly. I didn't want to mess up the meters. Since the lamps are run from the internal 12 volts supply (actually about 13.5 volts), a 1.5 kiloohm resistor was wired in series to set the current at about 9 mA. LEDs being glued in place on the meters. The LEDs are glued to the back of the meter faces. Superglue would have been perfect, but unfortunately, I was out. I ended up using 30 minute epoxy, but this particular stuff is so old it was more like 240 minute epoxy. I re-used the blue leads from the defunct grain of wheat bulb to wire in the negative terminal of the LEDs, and picked out some red wire for the positive side. I mounted the LEDs so the negative and positive corresponded to the terminals on the meter. Less chance of screwing something up. Toughest part of this exercise was wrestling the meter board back into place. After buttoning it all up, it was time for the moment of truth. Et voila, it works! The LEDs are not quite as diffuse a light as the grain of wheat bulbs, but they do a respectable job of indicating that the amplifier is turned on. It might be nice to get some more even illumination, but I'm pretty satisfied. Perhaps I might add some reflection inside the meters next time I need to open the box -- which hopefully, won't be for a while. Maybe in another five or six years.